Hearts' Robbie Neilson says it was a tale of missed opportunities that led to his side dropping another two points at home to a dogged Kilmarnock. "We should have been probably four or five goals up at half-time," said the head coach after the 1-1 draw at Tynecastle. "We had some fantastic chances but didn't take them. Second half, we had three or four real clear-cut chances." "But if you don't take them then you are really going to struggle in games." Hearts are without a league win since August and Neilson says it will be a season of ups and downs in the Scottish Premiership. "It's a very difficult league." Neilson told BBC Scotland. "Look at Aberdeen, who got beat 5-1 today by St Johnstone and they are sitting at the top and they get beat convincingly. "Everyone knows we can beat each other, but we have to try to get back working hard and today we should have taken three points." Striker Gavin Reilly was sent off late in the game, but Neilson would not criticise referee John Beaton for the decision, nor make this an excuse for the result. "The referee didn't miss clear-cut chances for us, so it's up to us to score goals," he said. "No problem with the red card. It was his decision to send him off." 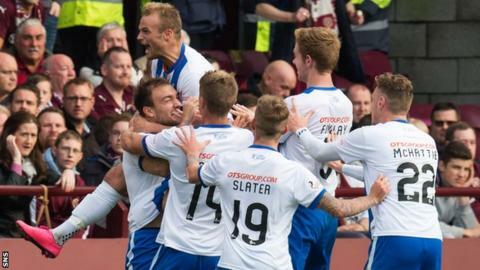 Killie boss Gary Locke thought his side were worthy of at least a draw. "First 25 minutes or so, I was really pleased with the performance and, when you come to Tynecastle, you have to weather the storm a little bit and they had a few chances before half time," said the former Hearts boss. "But we came back strongly in the second half and deservedly got the equaliser." Locke said defender Conrad Balatoni should not have made the rash challenge that led to the penalty that gave Hearts the lead. "We spoke about at half time and it is a very very soft penalty decision against us again to be fair," he said. "But, if he doesn't make the challenge, the referee does not have a decision to make." Balatoni grabbed the equaliser and Locked added: "I thought he responded really well."